The alarm on my phone goes off to tell me it's time to quit with the administrivia and get onto painting. 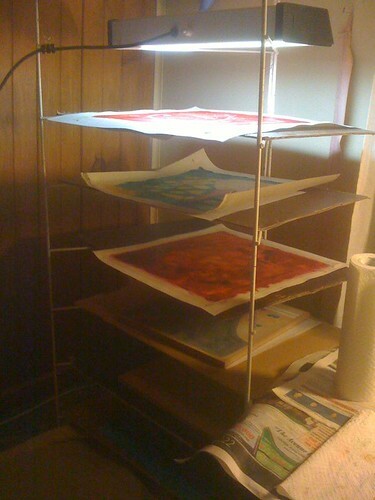 I move over to the drying rack and cautiously test each painting in turn. Wet. Wet. Wet. Wet. Wet. Wet. It's been at least two weeks since I began painting the summer installment of the art filled cookbook. There are six paintings still wet and on the drying rack. I am waiting. Eventually one of them will dry and I may proceed with it's next layer. In summer (it is midwinter where I am in country Victoria) the paintings go outside for a few hours on sunny days. This speeds up their drying time. Not due to the heat of the sun, but due to the UV. The 'drying' of oil paints is actually an oxidation and chemical cross linking process. Like many chemical processes it is helped by a small amount of heat, but the key ingredients are airflow and UV light. The air provides the oxygen the oil needs to combine with to oxidise and the UV acts as a catalyst. The frustration of being stalled got me to thinking about recreating the summer conditions that enable the paintings to dry at a much faster pace. Ebay to the rescue, I am now the owner of a UV light designed to simulate rainforest sunlight for frogs in captivity. It's not the desert conditions I originally aimed for, but an experimental start that will be gentle on the paint pigments and, in theory, do away with the torture of paint never dries.